For nearly 20 years his smiling face was familiar to millions of viewers: Every day, rain or shine, he was there on the plaza as TODAY greeted America. His name was Linny Boyette, but he was perhaps better known as TODAY's superfan. Sadly, Linny passed away Sunday due to complications from a heart attack, and everyone at TODAY mourns him as a departed member of the show's family. He was 71 years old. "We actually get more viewer mail about Linny than any of our on-air team," said Natalie Morales. "And we understand because we love Linny too and we're certainly going to miss him." On Sunday night, Willie Geist and Meredith Vieira, who spent a lot of time with Linny over the years, tweeted about him after hearing the news. 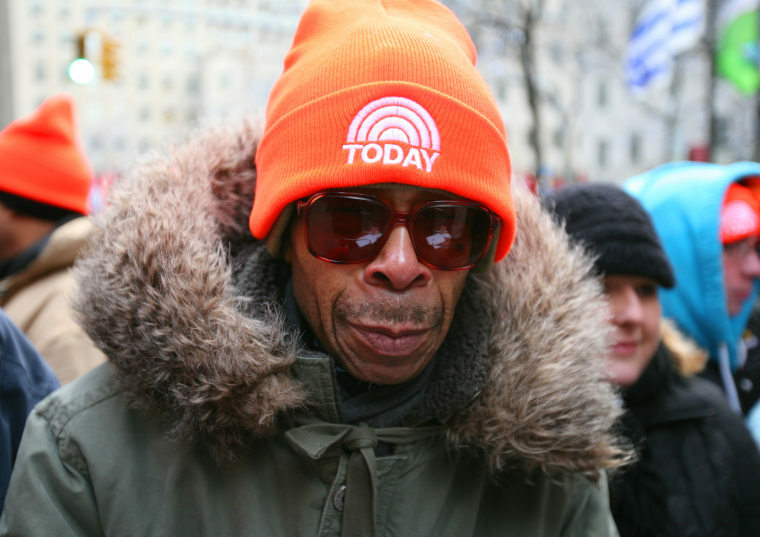 A military veteran born in England, Linny rose each morning at 3:30 a.m. and took the subway from his home in the Bronx, N.Y., to arrive on the plaza by about 5:30 a.m. Having reserved his spot, he would pass the time until the show began at 7 by reading the paper, drinking tea and chatting with other fans. "It's something to do every morning. It makes my day," he told TODAY.com in 2010. Over the years he became regarded as a member of the family, and he was on a first-name basis with many of the anchors. He was particularly close to Meredith during her five years on the show. In fact, just minutes after Meredith announced she was leaving the show in May 2011, she stood next to Linny on the plaza to see what it would be like being a fan instead of an anchor. And when she made a return visit in April 2012, she stood next to Linny on the plaza holding a sign reading, "Forget Matt! Here for Linny." Afterward, she brought him into Studio 1A with her. When Linny was absent from the plaza for a time earlier this year due to health issues, it was noticed — and when he reappeared in March, he got a warm welcome from Matt, Al and Savannah. Unfortunately, his health problems recurred, and now, no matter how crowded the plaza gets with TODAY fans, the daily presence of the greatest TODAY fan of all will never be forgotten. "It means togetherness and peacefulness," Linny once said of TODAY. "It gets better every day ... never a dull moment on this show." The TODAY family shared their condolences.